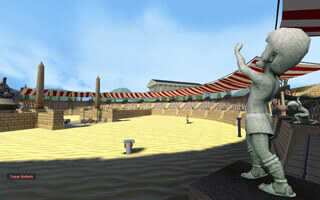 Babel Babel got a major graphical update yesterday, the lighting looks much better now, with shadows finally being visibly cast into the arena. Most of the time we were struggling with the usual problems you get when you’re exporting models from Maya for HL2. Textures not working, invisible props etc. We’ve had all these problems before, but somehow you always forget one of the 1000 possible solutions that you have to use this time. We also had a bunch of ideas on how to improve the look even further, so stay tuned for more updates in the future. You can take a look at a bunch of screenshots at the new website for the game here.